Competitive gaming and eSports are not a new phenomenon. The act of playing games for sport has been growing in popularity since the mid 90's. From Doom 2 deathmatch, NetQuake and Descent, to Warcraft 2 on Kali, Diablo and Ultima Online PvP—to say nothing of going down to the local arcade to spend your quarters and wait your turn on Street Fighter 2—people have loved playing each other in video games. Although eSports has only reached new heights largely due to the growing number of competitive players at organized tournaments like Major League Gaming's Pro Circuit and GOMTV Global StarCraft II League, there is a rich, detailed history of events from the past 15 years. The vibrant, passionate, competitive communities across several games and genres are, arguably, the backbone of some of the largest developers in the world. Blizzard, Bungie, Infinity Ward, id Software, Valve, Capcom, and Epic all have, behind them, strong competitive gaming fanbases. Players have dedicated their entire lives to being the very best, with skill ceilings you couldn't stick ladders to get to. For those who don't like to watch other people play video games, give the best moments in eSports a shot. You may very well start. Many would consider Jang "Moon" Jae to be the best Warcraft 3 player of all time. He was nicknamed "The Fifth Race" by the community for his innovative and dominant play with Night-Elf. He signed a three-year, $500,000 deal in 2009. Many would also consider Orc hero Manuel "Grubby" Schenkhuizen to be the best western Warcraft 3 player of all time, having won the most titles and recently started his own personal brand, very much in the vein of the most accomplished western professional player of all time, Johnathan "Fatal1ty" Wendel. By 2006, both players had dominated the Warcraft 3 scene, taking 16 titles combined. Grubby's streak included western events ESWC 2005, DigitalLife 2005 and BlizzCon 2005. Moon had been cleaning up against harder competition winning two seasons of WEG and three seasons of MBCGame. They had also never met each other in an official match before. The fandom and passion for Warcraft 3 in China is rivaled only by Korea's zeal for Starcraft, leaving no better stage for such a matchup than the World eSports Games Semifinals. Although both players were at the peak of their play, anyone you asked had Moon as the favorite going into the match. At the time of play, Moon had gone an undefeated 28-0 in televised play against Orc players. During the 2006 era of play, Night-Elf's Druid of The Talon/Claw was so difficult for Orc players that Grubby was quoted in a pre-event interview saying "if you want to be good vs NE as an Orc, you need like one month full concentration on this match-up and that means you can't practice anything else, making u worse vs Orc, Human, and Undead." That quote was also in reference to Moon whom he was happy not to face – in the group stages. Grubby takes down Moon 3-1 to break the Fifth Race's undefeated streak, and to provide a breakthrough for all of his Orc brethren. In one of the only times I can remember, fans rush the stage—like they swarm the court at the end of college basketball games—and mobbed Grubby at his computer. Grubby's close friend and teammate Yoan "ToD" Merlo won the other semifinal in similar upset fashion against Chinese superstar XiaoFeng "Sky" Li to set up their dream final. The Korean Starcraft fanbase has catapulted professional players at the dawn of the millennium to heights that Western audiences still have yet to see. Two players emerged at the forefront. They were the sport's ambassador: the Emperor, Lim "SlayerS_BoxeR" Yo-Hwan, and his long-time rival, Storm Zerg Hong "YellOw" Jin Ho. What started in 2001 with a nailbiting 3-2 victory for BoxeR in the Coca-Cola OSL, extended throughout the history of Korean Starcraft, even into YellOw's recent retirement from the game two weeks ago. By 2004 YellOw had a second nickname coined for him: the "King of Silver." He consistently lost to BoxeR or NaDa in tournament finals. BoxeR and YellOw once again met up in the 2004 OSL Semifinals, BoxeR looking for his third StarLeague title, YellOw just to take out BoxeR. What developed is one of the first and greatest showings of mindgames and swagger that Starcraft can offer, and why BoxeR has been king. BoxeR bunker-rushes YellOw three times in a row to sweep the series and head to the grand finals. BoxeR had specially prepared three straight bunker rushes that would be extremely hard for a Zerg player. Beyond that, he messed with YellOw's head–-and everyone else's more than ever before. BoxeR went on to lose in a close 3-2 series to teammate Choi "iloveoov" Yeon-Sung in the Finals. Contrary to what most people would expect, the Counter-Strike 1.6 community had more prize money in 2009 than it ever had in the scene's history, even though the game was a decade old. New strategies were still coming out, old strategies were brought back, and current ones were refined. This kept the game fresh, earning it a claim as the most skill-oriented real-time FPS shooter on the market. In 2009 Swedish team Fnatic had taken the community by storm, coming through with the most dominant performance in a year with what was considered the most competitive year in the game's history. Led by Patrik 'cArn' Sattermon, MVP Patrik "f0rest" Lindberg and rising star Christopher "GeT_RiGhT" Alesund swept every major event that year including Season 3 of the Intel Extreme Masters (beating AgaiN), ESWC 2009, and World eSports Masters 2009. They earned a then-record breaking $153,122 in prize money. This led upto the 2009 World Cyber Games, one of the last events of the year, and an event that the Fnatic organization had never won in it's history. Many believed this to be the year for that to happen. Polish team AgaiN, who had the same lineup together for many years, was looking to become the only CS team in history to win two WCG titles, having won the 2006 finals in Italy. AgaiN, led by their superstar Filip 'Neo' Kubski, had been slumping all that year with disappointing results, but were known to step it up in big moments. This was one of them, as China's love for eSports extends past Warcraft 3 to all genres, setting up an extraordinary shot of people watching the final game in the main hall, spilling outside the doors where screaming fans were crushed together. What transpired is one of the most memorable games in CS 1.6 history. Fnatic and AgaiN embark on one of the most legendary Nuke games in history. With Fnatic on matchpoint 15-11 (16 rounds to win) and AgaiN low on money with only enough for two of their players to buy, AgaiN executes some beautiful teamwork to win four rounds in a row and send it into overtime. Both teams would trade round after round, each coming through in the clutch. They forced the match into four overtimes. With the score 27-26 in favor of AgaiN, fnatic's GeT_RighT had a large health advantage over a 20 health LordB. GeT_RighT would lose his second crucial 1 v 1 moment of the match, giving AgaiN the win. They would go on to win the second map 16-12, and take their second WCG title. Fnatic has never won the World Cyber Games. While the CPL's name was marred in several controversies in its history and is mocked today by all angles of the eSports industry, it was king in 2005. They had just announced the CPL World Tour, a $1,000,000 tournament series with stops in nine countries, and a $500,000 final in New York City on MTV Overdrive inside the Nokia Theater. The games featured on the tour were a duel-deathmatch FPS, which had been a staple at the CPL, along with Counter-Strike 1.6. What many did not see coming was that Painkiller, most likely known for "shooting shuriken's and lightning", was the game the CPL used. They didn't use the world standard that was Quake 3 nor its sidekick Unreal Tournament 2004. One person not complaining was Sander "Vo0" Kaasjager, the Dutch Quake ProMode madman. He excelled at a gameplay form that was different than the vanilla Quake 3 gameplay in a number of areas, including fast weapon-switching and Quakeworld-style air control while strafing. Both such elements were prevalent in Painkiller, but not much so in Quake 3 or UT2004. Quake and UT were the games Johnathan "Fatal1ty" Wendel had won championships in. Painkiller is a deathmatch game where aggression is rewarded more than ever, a style that perfectly fit Vo0, but not the rather defensive and calculated Fatal1ty. It showed throughout the CPL World Tour season as Vo0 went 5-2 against Fatal1ty, with all championship matches earning him five titles, MVP of the year, and first seed for the finals. While Fatal1ty won two of his own, Vo0 was considered to be the best Painkiller player in the world by a good bit. Both players progressed through the finals in NYC to meet in the winner's bracket final, where Vo0 disposed of Fatal1ty handily 2-0. Fatal1ty would come back through the lower bracket to face-off against Vo0 in the grand finals for a $150,000 first place prize, the largest top-end prize purse in eSports history. Fatal1ty makes a remarkable comeback in four straight maps to beat Vo0 4-2. Fatal1ty's playstyle turned extremely defensive, which worked well for him and frustrated Vo0 more than any other plan could. Fatal1ty forced Vo0 into positions that he had not experienced all year, and took him by surprise. While not the flashiest match to watch, the defensive mind-games in such an aggressive game really are fun to observe. Fatal1ty took home a record-breaking $150,000 and cemented his legacy as the most accomplished Western pro gamer of all time. Before the Justin Wong/DaigoUmehara rivalry blossomed to what it is today, the original American Street Fighter superstar Alex Valle had his own rivalry against The Beast. These two men started competing in what was the first-ever meeting between the U.S. and Japan in any Capcom fighting game. Daigo, with his V-Akuma, made his first-ever trip to the States by winning an extremely large Japanese qualifying tournament, while Valle was America's best. Both players saved tactics for the finals, holding back in previous rounds, including special mixups from Valle's V-Ryu that Japan had never seen before. The crowd then was just as hyped as the fighting game community's crowd is now, an ever-passionate community. Match footage and part six of a six-part documentary. Daigo Umehara makes a mark that has been repeated and elevated every year to this very day, defeating Alex Valle in a close 2-1 set in clutch fashion. The beginning of 13-year legacy for the best Street Fighter player ever. StarCraft 2 (along with Street Fighter IV) has been the biggest boom to eSports in quite some time, possibly ever. The SC2 community has now gathered a very skilled, large and diverse group of professional players. Leagues have organized several million dollars in combined prize money along with decent salaries and the necessary practice conditions for all players worldwide. Games have been extremely entertaining and watched in larger numbers than ever before. But many don't realize that StarCraft 2 is still such a young game, only one year old. The skill cap and metagame still have a ways to go, especially with two more games coming out. Just this past weekend in the NASL finals, Min Chul 'MC' Jang and Lee "PuMa" Ho Joon showed us the highest amount of skill in StarCraft 2 that we've seen thus far. Most expected MC in the finals. as he has been the most consistent Starcraft 2 player to date (albeit a bit of a few months back). PuMa, a StarCraft 1 A-teamer who recently switched to Starcraft 2, came over to America for the first time on a whim by winning a 1024-man open bracket for the last qualifying spot. This was his first major SC2 singles tournament appearance. The experience and mechanics he brought over as a recent SC1 player propelled him all the way into the finals against MC, a final everyone wanted to see. As the finals were a very American-sports-style Best of Seven, the match that transpired was one of those great sports moments: A Game 7. Unexpected by most, PuMa went up 3-1 against MC, putting a lot of pressure on himself as he has shown nerves to get to him in big moments, while MC has been used to it. MC used this to his advantage and brought the series back with relentless play, coming back from the dead four or five times on the sixth map, all to force the epic Game 7. After six straight-up long games, MC tried to keep this one short with aggression, but PuMa's defense in response was perfect...perfect enough to make the guy that wasn't even supposed to be there, PuMa, $50,000 richer. Team 3D, later known as Final Boss, had a run through Halo 1 and 2 that is historic. It's unlike anything that has ever been accomplished by any other team during the existence of the franchise. They have won 18 of the 23 total MLG Halo 1 & 2 events, placing second at the five they didn't win. The core lineup of Tom "Ogre2" Ryan, Dan "Ogre1" Ryan, and David "Walsh" Walshy, propelled them to become the most famous Halo team of all time. 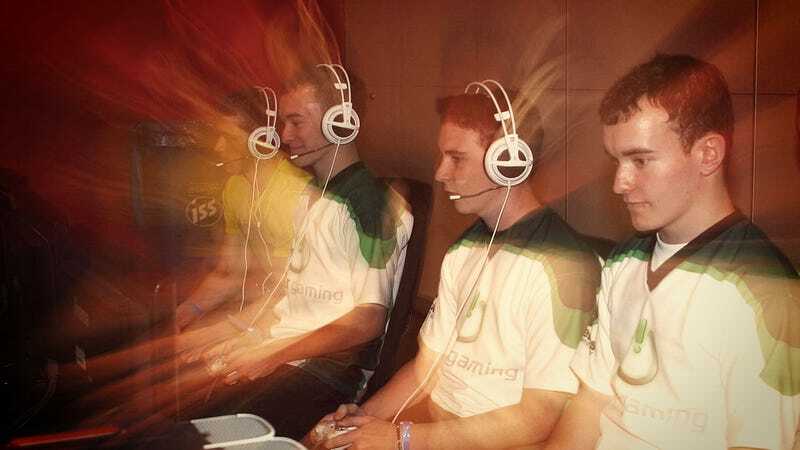 Along their run in 2005, they had a critical Game 5 National Championships Finals match on Oddball Midship against Team Phreaks (Ghandi, ShocKWav3, StrongSide& Karma). The match went down to the very last seconds, as both teams were tied at 4:58 (of 5:00!). The winner of this map would very likely go on to win the series. Both sides kill each other's whole teams several times over in the final minute. Team 3D comes through in the clutch to gain the victory and get themselves on championship point. They would shortly thereafter defeat Phreaks, giving them the 2005 National Championship and an undefeated season. The Russian Anton "Cooller" Singov and Belarussian Alexey "Cypher" Yanushevsky have been dominating and entertaining the Quake world for more than a decade with a style of play that brings out the very beauty that the game beholds. Air rockets, prediction railgun shots and plasma balls, a perfect hitscan lightning-gun, and mindgames within mindgames are the elements expected in these match-ups. It was more than that with these two. Cooller was the oldschool legend who had been trucking through and making people look like "nothink on lan". Cypher was five years younger than Cooller and considered his foe to be his idol. Watching the Russian play had inspired him to play competitively. As Cypher grew in prominence, he started to meet Cooller in the brackets quite often, winning nearly all the time. Cooller was having trouble with one of his finest students, and couldn't get around it. Cooller had never won QuakeCon before and wanted that trophy. Commentary on all maps by Jay "2GD" Harding & Joe Miller. With Cooller up 2-1 in maps and on the verge of his first ever QuakeCon championship, Cypher plays one of the most intelligent defensive Quake games in history, running and dodging on the fastest and most aggressive map of the game. Cypher forces Overtime on the fourth map to send it to a fiftth. Both players' mindgames are fully on display on the last map. There is a low score throughout and another overtime to boot. Cypher takes a one-frag lead with 30 seconds remaining and nine health to his name, claiming his second QuakeCon title. The two biggest stars in Brood War were Lee "Flash" Young Ho and Lee Jae Dong, having met in the last two major tournament finals in Korea (MSL and OSL), and at least one of them competing in the finals of the last seven major titles. Flash was looking for his third OSL championship which earns him The Golden Mouse, a status only three players had achieved (including Jaedong in 2009). He would also become the second player ever, after Lee "NaDa" Yun Yeol, to win OSL and MSL gold in the same season. He was confirmed as the first player to be in six consecutive MSL and OSL finals. And he was also gunning to take down Jaedong in three straight tournament finals, something Jaedong clearly did not want to happen. For the first time in history, the OSL finals occurred outside of Korea, landing in Shanghai, putting even more hype on the event. Flash knew what had to be done. Flash wins the OSL Golden Mouse, MSL and OSL in the same reason, scoring three wins in a row over his rival, Jaedong. Since then he has won another MSL, winning the Golden Badge, a similar three-title championship like the OSL. He is the second player to ever do this next to NaDa, and will look to surpass him for most championships ever won on road to the best Starcraft player of all time. Capcom's Seth Killian told a stat on a recent tournament live stream about the number of views the Daigo vs Justin Third Strike video has gotten from all the videos combined. It's in the 20+ million range, making it the most-watched competitive gaming moment of all time. This match, and one 37-second moment, seems to capture the core essence and emotion of what we all feel about competitive gaming in the scene's community. If you haven't seen it, do so now. And if you haven't seen the full match, also do that, you may learn something. Daigo Umehara creates the most memorable moment in history. Daigo wins an extremely close final in the biggest Street Fighter IV tournament at that time. Daigo has won EVO SF4 twice in a row, and is looking for his third straight this month. I hope some people will come away from this with a greater understanding of eSports, and to have felt what all of us do when we watch these games. Big thanks to Duncan "Thorin" Shields and Tony "Ponder" Cannon for their vast knowledge and expertise within this field. Rod "Slasher" Breslau works for Major League Gaming as well as co-hosts and produces a Live On Three, a live podcast about all eSports. Major League Gaming's next Pro Circuit competitionis being held at the Anaheim Convention Center July 29-31. It will feature StarCraft II: Wings of Liberty on PC, Call of Duty: Black Ops on the PlayStation 3, and Halo: Reach on Xbox 360, all of which will be streamed online throughout the weekend. Follow MLG's Twitter for updates. Live On Three airs every Wednesday at 7 PM EST on the One More Game website.